ProIL-1β processing by IL-1β-converting enzyme (ICE) and the subsequent release of mature IL-1β are highly regulated events in the monocyte/macrophage response to pathogens. This process occurs in a controlled way through the activation of the constitutively expressed 45-kDa ICE precursor (proICE). To characterize the signaling pathways involved in ICE regulation in human monocytes/macrophages, we analyzed ICE activation in the presence of specific inhibitors of classic signaling pathways. Although LPS-induced ICE activity was not significantly affected by interruption of extracellular signal-regulated kinase, p38 kinase, or phosphoinositol 3-kinase, Janus kinase 3 (JAK3) inhibition produced a significant dose-dependent enhancement of LPS-induced ICE activity. Support for the inhibitory role of JAK3 was shown by the fact that IL-4 (which uses JAK1 and JAK3 signaling) suppressed LPS-induced ICE activity and by the finding that JAK3 knockout macrophages have increased LPS-induced ICE activation. To understand how JAK3 down-regulates LPS-induced ICE activity in monocytes, we hypothesized that JAK3 signaling enhances IL-10 production. In support of this model we show that LPS-induced IL-10 expression was synchronous with ICE deactivation, IL-4 induced the release of IL-10, exogenous IL-10 suppressed LPS-induced ICE activity, a neutralizing IL-10 Ab increased LPS-induced ICE activity, and, finally, JAK3 knockout macrophages displayed significantly reduced LPS-induced IL-10 production. These findings support a model in which JAK3 signaling enhances IL-10 production leading to down-regulation of ICE activation and suppression of IL-1β processing and release. Interleukin-1β is a proinflammatory cytokine produced by blood monocytes and tissue macrophages that functions in innate host defense to induce inflammation. IL-1β is synthesized as an inactive precursor that requires a unique cysteine protease, IL-1β-converting enzyme (ICE;3 caspase-1) to generate a biologically active mature form (17 kDa) from proIL-1β (31 kDa) (reviewed in Ref. 1). As an innate immune mediator, IL-1β exerts clinically evident dual effects dependent on the level of production of its biologically active form. In moderate concentrations, IL-1β activates the NF-κB signaling pathway to express genes, including cytokines and chemokines, to alert other cells to danger as part of the protective immune response (reviewed in Ref. 2). However, overproduction of IL-1β can produce the features of septic shock, including hypotension, capillary leak, and acute respiratory distress syndrome (3, 4, 5). Conversely, underproduction of IL-1β can predispose to overwhelming infection and death (6, 7). Therefore, controlling the production of functional IL-1β is critical to proper functioning of an innate immune system. Improved understanding of this regulation is important to our ability to modify inflammation, host defense, and tissue injury. In monocytes and macrophages, ICE activity seems to be tightly regulated to control excessive maturation of the proinflammatory cytokines IL-1β and IL-18 (8, 9, 10, 11). Inactive proICE (p45; 45 kDa), containing an N-terminal caspase recruitment domain (CARD) (12), is induced by stimulants such as bacterial components, including LPS or other stimulatory cytokines (13, 14). Activation of proICE involves cleavages at four different aspartic acid residues to release CARD and yield p20 and p10 pieces that rearrange to form a functional tetramer, (p20/p10)2 (15, 16, 17). Each tetramer contains two active sites, which include the pentameric amino acid sequence (QACRG) of p20 and other components of p10 (15). In the past decade, extensive research has provided a better understanding of how ICE is activated upon stimulation of monocytes/macrophages. Important advances include recognition of the critical involvement of a tyrosine kinase (18), identification of related CARD-containing proteins (reviewed in Refs. 19 and 20), and detection of a multimeric inflammasome composed of ICE, caspase-5, apoptosis-associated speck-like protein, and the pyrin homologue NACHT-, LRR-, and PYD-containing protein-1 (21, 22). However, the details of ICE activation remain incomplete. In this report, our data demonstrate the previously unrecognized role of Janus kinase 3 (JAK3) in the regulation of ICE activity. JAK3 is one of four known JAKs and is a nonreceptor tyrosine kinase functionally associated with cytokine receptors that share the common γ-chain (γc) of IL-2 family cytokine (IL-2, IL-4, IL-7, IL-9, IL-15, and IL-21) receptors (reviewed in Refs. 23, 24, 25) (26). JAK3 mutations are not clinically distinguishable from the γc mutation, as both produce SCID (reviewed in Refs. 27 and 28) (29, 30). JAK3−/− mice grow normally in a pathogen-free environment. However, JAK3−/− mice show severe defects in lymphopoiesis and in negative selection of lymphocytes, indicating that JAK3 plays a key role in lymphoid development (31, 32, 33). JAK3 is predominantly expressed in cells of hemopoietic origin (reviewed in Refs. 23, 24 , and 27). JAK3 is expressed at low, but detectable, levels in monocytes and is induced by LPS and IFN-γ (34). We report in this study that a JAK3 signaling pathway negatively regulates LPS-induced ICE activation. One mechanism of this pathway is the inhibitory autocrine action of IL-10, which is induced by LPS through JAK3 signaling in LPS-stimulated monocytes/macrophages. Human recombinant cytokines (IL-1, IL-4, and IL-10) were purchased from R&D Systems (Minneapolis, MN). Caspase-1 Abs (G273 and R105) were gifts from Dr. D. Miller (Merck Research Laboratories, Rahway, NJ). Ac-YVAD-CHO, Ac-DEVD-CHO, AG126, JANEX-1 (WHI-P131), SB202190, U0126, PP2, and wortmannin were obtained from Calbiochem (La Jolla, CA). Ac-WEHD-AMC and Ac-DEVD-AMC were purchased from Calbiochem or Alexis Biochemicals (San Diego, CA). Bacterial LPS, Escherichia coli strain 0127:B8, Westphal preparation, was obtained from Difco (Detroit, MI). RPMI 1640 and PBS were purchased from BioWhittaker (Walkersville, MD), and FBS was obtained from HyClone (Logan, UT). All other reagents were obtained from Sigma-Aldrich (St. Louis, MO) unless otherwise specified. Human peripheral blood monocytes were isolated from the heparinized blood of normal donor or buffy coats. First, PBMC were isolated by using Histopaque-1077 density gradient. Then monocytes were further purified with a system of MACS CD14 Microbeads (Miltenyi Biotec, Auburn, CA) for CD14+ monocytes. This method yields >95% pure monocytes. Isolated monocytes were cultured in a 5-ml polypropylene tube at 1.5 × 106 cells/ml in RPMI 1640 supplemented with 10% FBS at 37°C in humidified incubator, and all data from the assays were converted to 1 × 106 cells/ml. Typically LPS (1 μg/ml) were used to stimulate fresh monocytes along with other reagents (inhibitors or cytokines) as indicated. After monocytes were treated, the culture media and cell pellets were collected by centrifugation at 800 × g for 10 min at 4°C. The cell pellets were washed with cold PBS three times. Cells were lysed in a cold lysis buffer (50 mM Tris-Cl (pH 8.0), 150 mM NaCl, 2 mM EDTA, and 1% Nonidet P-40) containing 10 μg/ml aprotinin, 1 μM bestatin hydrochloride, 1 μM pepstatin A, and 1 mM AEBSF on ice for 20 min at 4°C. The cell debris and nuclei were removed by centrifugation at 14,000 × g for 10 min at 4°C. The protein concentrations of the cell extracts were determined using a Bradford protein assay reagent (Bio-Rad, Hercules, CA) to load equal amounts of proteins on a gel. The proteins were resolved by SDS-PAGE and transferred to a nitrocellulose membrane. Nonspecific sites on the nitrocellulose membrane were blocked with 5% nonfat dry milk (Carnation; Nestle, Solon, OH) in TBST (25 mM Tris-Cl (pH 7.5), 150 mM NaCl, and 0.05% Tween 20) for 30 min at room temperature. The membranes were then probed with primary Abs, followed by peroxidase-conjugated secondary Abs as indicated, and protein bands were visualized by ECL (Amersham Pharmacia Biotech, Arlington Heights, IL). For ICE activity measurements using a fluorescent substrate, 3 × 106 cells were typically lysed in 60 μl of a lysis buffer (50 mM HEPES (pH 7.4), 100 mM NaCl, 0.1% 3-[(3-cholamidopropyl)dimethylammonio]-1-propanesulfonate, 0.1 mM EDTA, and the above protease inhibitors) for 20 min on ice, followed by centrifugation at 14,000 × g for 10 min at 4°C. Fifty microliters of the cell extract were mixed with 50 μl of an assay buffer (50 mM HEPES (pH 7.4), 100 mM NaCl, 0.1% 3-[(3-cholamidopropyl)dimethylammonio]-1-propanesulfonate, 20% glycerol, 10 mM DTT, and 0.1 mM EDTA) and 5 μl of 1 mM Ac-WEHD-AMC (35). The mixture was placed in a well of a Costar 96-well flat-bottom plate (Corning Glass, Corning, NY) and immediately subjected to kinetic fluorometric assay using a Cytofluor 4000 fluorometer (Perseptive, Framingham, MA) with filters of 360 nm excitation and 460 nm emission for 2 h at room temperature. The linear change of the fluorescence of hydrolyzed free AMC per time and the protein concentrations of the assayed samples were used for calculating a unit activity with a conversion factor obtained from the assay for constructing an AMC standard curve. The rate of ICE activity change was calculated by determining the difference in ICE activity between consecutive time points divided by the time elapsed. In a case of caspase-3 activity assay, Ac-DEVD-AMC (35, 36) was used as a fluorogenic substrate. A modified version of a sandwich ELISA (37) was constructed to detect ICE. Briefly, 96-well Immulon IV plates (Dynatech, McLean, VA) were coated with protein G-purified G273, a goat polyclonal Ab generated against p20 and p10 ICE forms (also recognizes p45 forms). R105, a goat polyclonal Ab generated against p20 and p10 ICE forms (also recognizes p45 forms), was used as a sandwich Ab. The R105 was detected with a peroxidase-conjugated goat anti-rabbit Ab (Bio-Rad) and the TMB Microwell Peroxidase Substrate System (Kirkegaard & Perry, Gaithersburg, MD). Color development was stopped with 1 N H2SO4, and the resulting absorbance were read at 490 nm on an MR600 ELISA plate reader (Dynatech, Chantilly, VA). Sandwich ELISAs were developed in our laboratory to detect pro- and mature IL-1β as previously described (38). The coating Ab has been modified since the previous description. Briefly, mouse monoclonal anti-human IL-1β Ab (clone 8516; R&D Systems) was used as the coating Ab, and rabbit polyclonal anti-human proIL-1β-specific peptide Ab generated against aa 3–21 was used to sandwich the Ag for the proIL-1β specific ELISA. HRP-conjugated goat anti-rabbit Ab was used as a developing Ab. The mature IL-1β ELISA used the mAb clone 8516 and rabbit polyclonal mature IL-1β Ab (raised against entire 17-kDa mature IL-1β) as coating and sandwich Abs, respectively. Human IL-10 was measured using the Immulite automated chemiluminometer system (Diagnostic Products, Los Angeles, CA). After fresh monocytes were treated with human IgG (240 μg/1 × 106 cells) for 1 h to block nonspecific FcRs, monocytes were stimulated with LPS (1 μg/ml) in the presence of mouse IgG2b anti-human IL-10 mAb (clone 23738; MAB217; R&D Systems) or mouse IgG2b control mAb (clone 20116; MAB004; R&D Systems) for 7 h. Supernatants of the culture were subjected to ELISA for quantitating released mIL-1β. Cell pellets were subjected to measuring ICE activity using Ac-WEHD-AMC. JAK3 knockout (KO; 129S4-Jak3tm1Ljb) and control (C57BL/6J) mice were purchased from The Jackson Laboratory (Bar Harbor, ME). To increase the numbers of peritoneal macrophages, wild-type (WT) and KO mice were injected with sterile thioglycolate 7 days before the experiments. Peritoneal macrophages of 11-wk-old mice were obtained from peritoneal lavage with saline solution. After washing with cold RPMI 1640, isolated macrophages were resuspended in RPMI 1640 containing 10% FBS plus a mixture of antibiotics (penicillin and streptomycin; Life Technologies, Gaithersburg, MD) at 1 × 106 cells/ml in a 5-ml polypropylene tube and treated with 1 μg/ml LPS or 1 μg/ml LPS plus 5 mM ATP at 37°C in humidified incubator for the indicated period. Cellular and released mouse IL-1β were measured with a sandwich ELISA system using rat monoclonal anti-mouse IL-1β Ab (clone 30311; MAB401; R&D Systems) and goat biotinylated anti-mouse IL-1β Ab (BAF401; R&D Systems) as coating and sandwich Abs, respectively. Streptavidin-conjugated HRP (Amersham Pharmacia Biotech) and the TMB Microwell Peroxidase Substrate System (Kirkegaard & Perry) was used for detection. Western blotting of IL-1β was conducted with goat anti-mouse IL-1β Ab (AF-401-NA; R&D Systems) and rabbit anti-goat Ab (Bio-Rad) as primary and secondary Abs, respectively. Released mouse IL-10 was measured using a mouse IL-10 ELISA kit (eBioscience, San Diego, CA). Data are presented as the mean ± SD from at least three independent experiments. Simple comparisons were performed by Student’s t test, with p < 0.05 considered to represent statistical significance. In cases involving multiple comparisons, the Bonferroni correction was used (39). In efforts to identify a signaling molecule(s) or upstream enzyme(s) that modulates ICE activation in monocytes, we tested several specific kinase inhibitors (Fig. 1⇓). Compared with the control (DMSO), AG126 decreased ICE activity by as much as 80%. Wortmannin (a phosphoinositol 3-kinase inhibitor) minimally decreased ICE activity, whereas PP2 (an Src kinase inhibitor), SE202180 (p38 mitogen-activated protein kinase inhibitor), and UO126 (mitogen-activated protein kinase kinase 1/2 inhibitor) did not affect ICE activity. However, interestingly, JANEX-1 (WHI-P131; a specific JAK3 kinase inhibitor) (40) dramatically increased ICE activity (Fig. 1⇓). This unexpected observation led us to hypothesize that JAK3 signaling is involved in the down-regulation of LPS-induced ICE activation in monocytes. 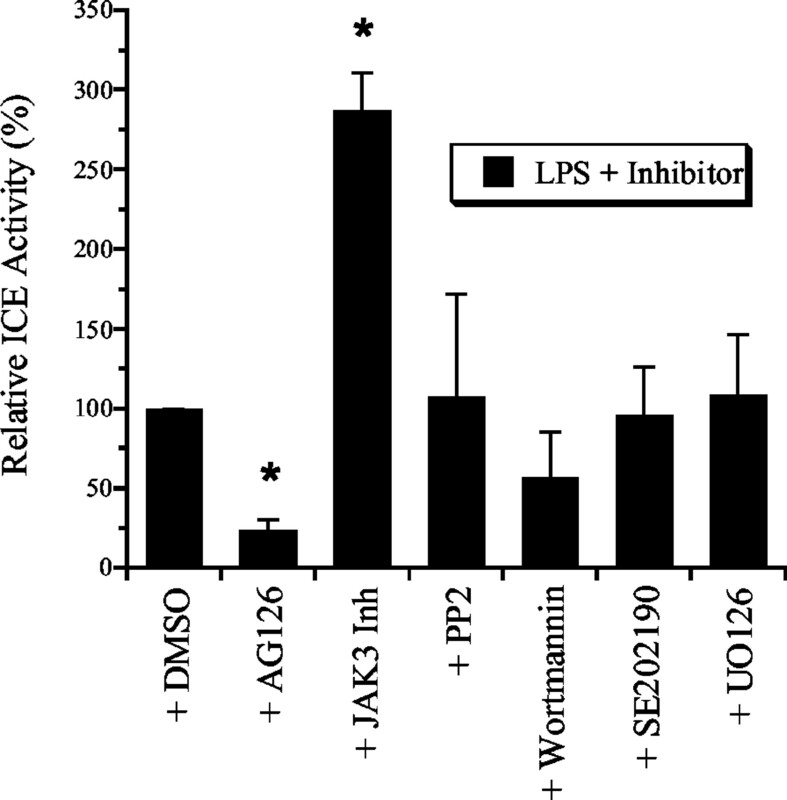 Effects of kinase inhibitors on LPS-induced ICE activity. Fresh monocytes were stimulated with LPS (1 μg/ml) in the presence of kinase inhibitors for 5 h. In these experiments DMSO (0.05%, v/v; as a control for inhibitors), 50 μM AG126, 50 μg/ml JANEX-1, 20 μM PP2, 20 μM wortmannin, 20 μM SE202190, and 10 μM U0126 were used. ICE activity was measured from cell pellets using Ac-WEHD-AMC, and results are presented as the mean ± SD from three independent experiments. ∗, p < 0.003 for the multiple comparisons between DMSO-treated and inhibitor-treated samples. The effect of JANEX-1 on LPS-induced ICE activity was dose dependent. 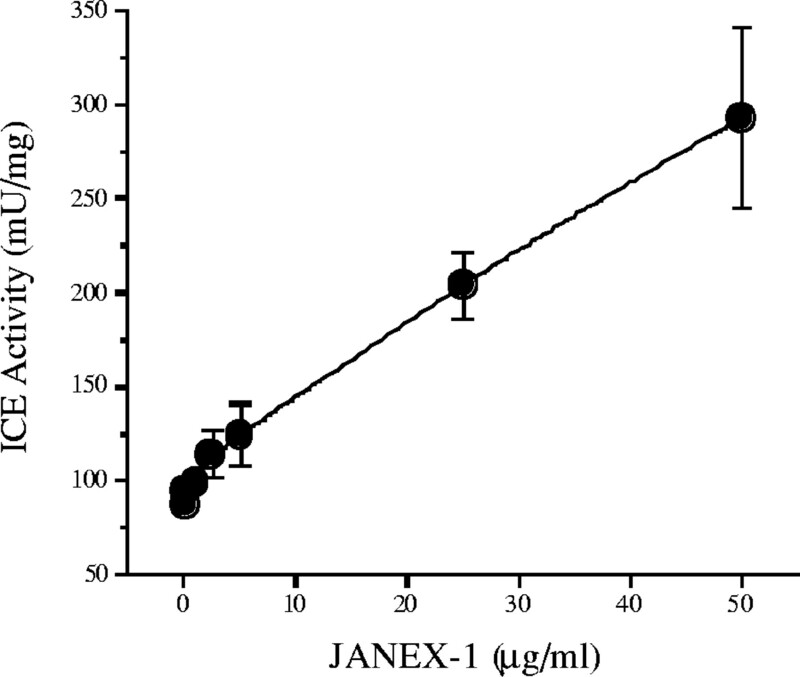 Treatment with higher doses of JANEX-1 resulted in higher ICE activity in LPS-stimulated monocytes (Fig. 2⇓). 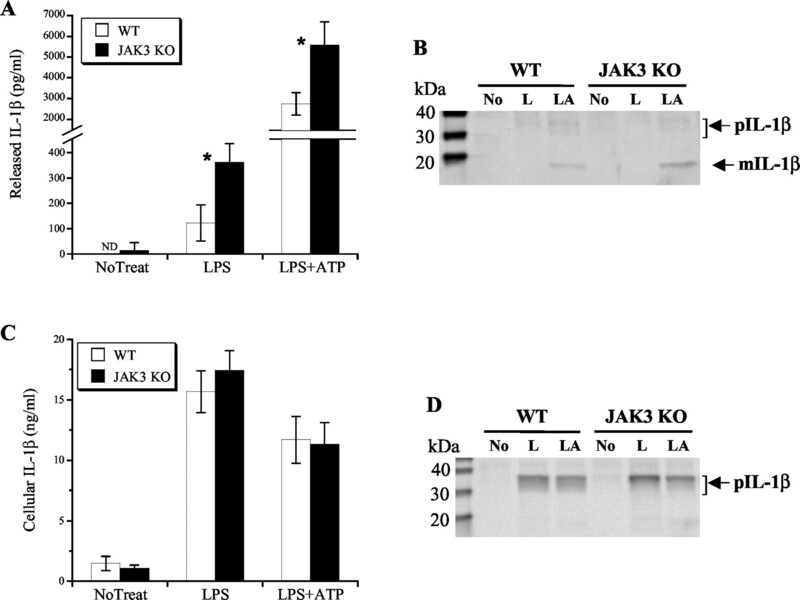 It was previously reported that JANEX-1 concentrations <350 μM (<100 μg/ml) do not inhibit JAK1 or JAK2 activities (40, 41); therefore, the observed effect is probably due to specific inhibition of the JAK3 pathway. Effect of a JAK3 inhibitor on LPS-induced ICE activity. Monocytes were stimulated with LPS (1 μg/ml) in the presence of increasing doses of a JAK3 inhibitor, JANEX-1, for 5 h. ICE activities obtained from three independent experiments are presented as the mean ± SD. IL-4, an IL-2 family cytokine, transduces its signals via JAK1 and JAK3. 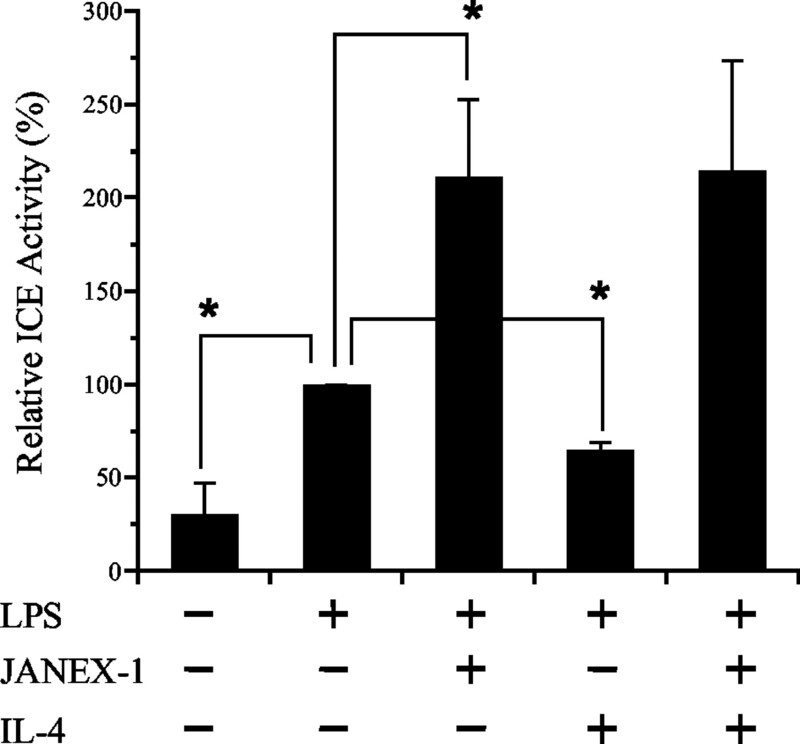 Fresh monocytes were treated with LPS (1 μg/ml) in the presence or the absence of IL-4 (20 ng/ml) and/or JANEX-1 (50 μg/ml) for 5 h and assayed for ICE activity by cleavage of Ac-WEHD-AMC (Fig. 3⇓). LPS alone induced ICE activation, and the addition of JANEX-1 further increased LPS-induced ICE activity. As expected, treatment with IL-4 reduced LPS-induced ICE activity by 30–60%, supporting the hypothesis that JAK signaling is involved in the down-regulation of ICE activation. 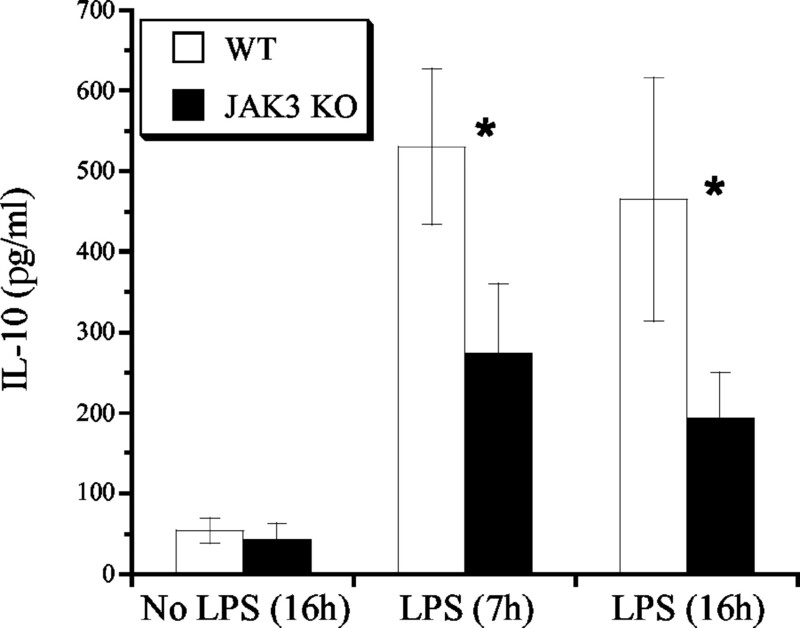 Furthermore, the inhibitory effect of IL-4 on LPS-induced ICE activity was blocked with the JAK3 inhibitor, demonstrating that the IL-4 effect on the down-regulation of LPS-induced ICE activation requires JAK3. Effect of JAK3 signaling on LPS-induced ICE activity. Monocytes were stimulated for 5 h with LPS (1 μg/ml), a JAK3 inhibitor (JANEX-1; 50 μg/ml), or IL-4 (10 ng/ml). As a control, the untreated sample contained DMSO (0.05%, v/v). Relative ICE activities are presented as the mean ± SD of three independent experiments. ∗, p < 0.005 for the multiple comparisons with the LPS-treated sample as a control. To further demonstrate that JAK3 is involved in suppressing ICE activity, JAK3−/− mice were compared with WT mice for LPS-induced ICE activity in peritoneal macrophages. Thioglycolate-induced peritoneal macrophages from JAK3−/− and WT mice were harvested and stimulated with LPS (1 μg/ml) or LPS, followed by ATP (5 mM) for the final 30 min, as ATP has been shown to increase LPS-induced ICE activity in monocytes (18). Supernatants were analyzed for released mature IL-1β as an indirect assessment of ICE activity, as processing of proIL-1β requires ICE. The levels of released mature IL-1β from LPS-stimulated or LPS- plus ATP-stimulated JAK3−/− macrophages were approximately double those from WT macrophages, as quantified by ELISA (Fig. 4⇓A) and confirmed by Western blot (Fig. 4⇓B), suggesting that higher ICE activity was induced in the LPS-stimulated JAK3−/− macrophages. This difference in release was not due to higher proIL-1β synthesis in the JAK3−/− macrophages, as quantified by ELISA (Fig. 4⇓C) and confirmed by Western blot (Fig. 4⇓D). This demonstration provides ex vivo evidence that JAK3 is involved in suppressing LPS-induced or LPS- plus ATP-induced ICE activity. Comparison of JAK3 KO and WT macrophages for LPS-induced IL-1β processing and release. Peritoneal macrophages (thioglycolate-induced) obtained from WT (n = 5) and JAK3 KO (n = 4) mice were stimulated with LPS (1 μg/ml) or LPS (1 μg/ml) plus ATP (5 mM) for total of 3.5 h. ATP was added 3 h after the addition of LPS. As an index to ICE activity, macrophage supernatants were analyzed for mature IL-1β by ELISA (A) and Western blotting (B). Macrophage pellets were lysed, and the cellular extracts were analyzed by ELISA (C) and Western blotting (D) for IL-1β detection. In the blots, No, L, and LA indicate no treatment, LPS treatment, and LPS plus ATP treatment, respectively. ∗, p < 0.05 for the comparison between WT and JAK3 KO states. To better understand how JAK3 reduced LPS-induced ICE activity, we investigated the kinetic effects of LPS on the patterns of LPS-inducible cytokine production. In LPS-stimulated monocytes, we observed that the peak rate of ICE activation and mature IL-1β release occurred 5 h after LPS addition (Fig. 5⇓, A and B, respectively). Of note, however, IL-4 was not detected in monocyte supernatants. Nevertheless, the related inhibitory cytokine IL-10 was detectable. IL-10 was first detected at 5 h and rapidly increased after 5 h (Fig. 5⇓C), although proinflammatory cytokines, TNF-α, IL-1β, IL-6, and IL-8, were detected as early as 2 h in monocyte medium (data not shown). The period of rapid increase in IL-10 overlapped with the deactivation period of ICE. Time course of ICE activation, IL-1β release, and IL-10 production from LPS-stimulated monocytes. Monocytes were stimulated with LPS (1 μg/ml) for the indicated periods. Cell pellets and supernatants of each culture were analyzed for ICE activity (A) and the levels of released IL-1β (B) and IL-10 (C), respectively. A, The inset represents the kinetic pattern of LPS-induced ICE activity as a function of the period of LPS treatment. The rate of ICE activation was extrapolated from the data in the inset. B, The inset represents the kinetic pattern of the level of the released mature IL-1β as a function of time after LPS. The rate of mature IL-1β release was extrapolated from the data in the inset. To determine whether the JAK3 pathway might induce the suppressive cytokine IL-10, we next asked whether a JAK3 stimulant, such as IL-4, might induce IL-10. IL-4 was added to LPS-treated monocytes. 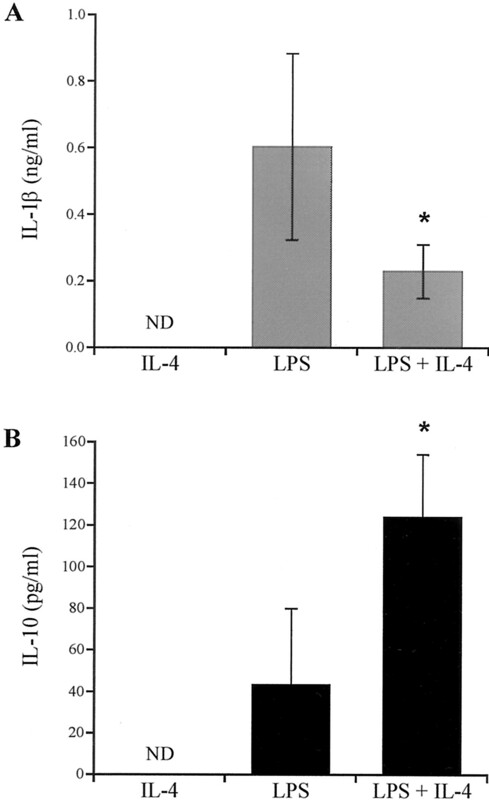 Early addition of IL-4 to LPS-treated monocytes suppressed the production of inflammatory IL-1β (Fig. 6⇓A). In contrast, early addition of IL-4 to LPS-treated monocytes increased production of anti-inflammatory IL-10 (Fig. 6⇓B). To confirm that JAK3 signaling plays a role in IL-10 production, we next measured the level of IL-10 production after treating LPS-stimulated monocytes with the JAK3 inhibitor. Fig. 7⇓ demonstrates that JAK3 inhibition inhibited IL-10 production in LPS-stimulated monocytes. Ability of IL-4 to affect IL-1β and IL-10 release. After monocytes were stimulated for 5 h with LPS (1 μg/ml) in the absence or the presence of IL-4 (20 ng/ml), the levels of released IL-1β (A) and IL-10 (B) in the supernatants of the cultures were determined by ELISA. Data are presented as the mean ± SD of four independent experiments. ∗, p < 0.02 for the comparison between the LPS-treated and the LPS- plus IL-4-treated samples. Ability of a JAK3 inhibitor to suppress LPS-induced IL-10 release. Monocytes were stimulated for 5 h with LPS (1 μg/ml) in the presence of increasing doses of a JAK3 inhibitor, JANEX-1. ICE activities obtained from three independent experiments are presented as the mean ± SD. As an additional approach, we compared LPS-induced IL-10 production in WT and JAK3−/− macrophages. In this study macrophages were stimulated with LPS (1 μg/ml), and the supernatants were collected 7 and 16 h poststimulation and analyzed by ELISA. The results indicated that IL-10 production was significantly lower in JAK3−/− macrophages (Fig. 8⇓), suggesting that JAK3 is necessary for efficient production of IL-10. Effect of JAK3 on LPS-induced IL-10 production. Peritoneal macrophages (thioglycolate-induced) obtained from WT (n = 5) and JAK3 KO (n = 5) mice were stimulated with LPS (1 μg/ml) for the indicated time periods. Supernatants of the macrophages cultures were analyzed for IL-10 by ELISA. ∗, p < 0.006 for the comparison between WT and JAK3 KO states. Finally, to determine the causal effect of IL-10 in modulating ICE activity, we tested the ability of exogenous IL-10 and of IL-10 blockade to modulate LPS-induced monocyte ICE activation. After monocytes were pretreated with excess human IgG to block nonspecific binding sites of FcRs, the monocytes were treated with LPS in the presence of IL-10 or IL-10 Ab. The effect on ICE activity is summarized in the Table I⇓. Exogenous IL-10 (10 ng/ml) indeed decreased LPS-induced ICE activity (40–60%), and the suppressive effect was dose dependent (data not shown). Although a control mAb did not significantly affect the LPS-induced ICE activity (90–110%), a neutralizing IL-10 mAb augmented LPS-induced ICE activity (140–150%). The effect on IL-1β release paralleled the effect on ICE (Table I⇓). These observations support the concept that LPS-induced IL-10 negatively regulates LPS-induced ICE activation in monocytes. Our findings document for the first time that JAK3 signaling is involved in the regulation of ICE activation. The JAK3 pathway functions to down-regulate ICE, as evidenced by the following findings. First, the inhibition of JAK3 by the JAK3-specific inhibitor (JANEX-1) increased LPS-induced ICE activity in a dose-dependent manner. Second, treatment with exogenous IL-4 (which signals via JAK1 and JAK3) suppressed LPS-induced ICE activity. 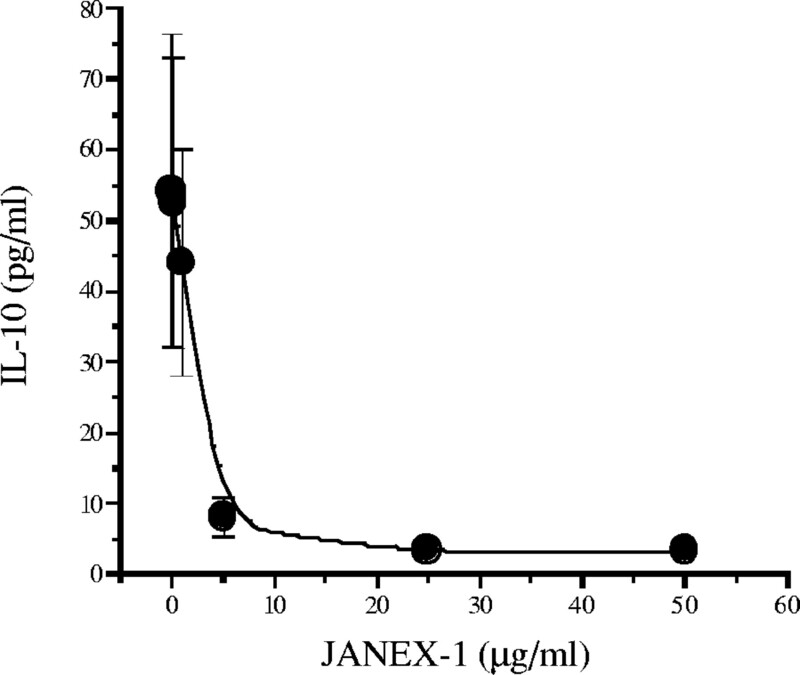 Third, the suppressive effect of IL-4 was blocked by the addition of JANEX-1, confirming the participation of JAK3. Finally, JAK3 KO macrophages demonstrated enhanced mature IL-1β release upon LPS stimulation, indicative of increased LPS-induced ICE activity. Having made the link between JAK3 and ICE activities, we next turned to understanding how this may occur. To investigate this, we evaluated the role of IL-10 in this pathway. We showed that 1) IL-4, which works through a JAK3 mechanism, induced IL-10 production by monocytes when copresented with LPS; 2) the time course of LPS-induced IL-10 release from monocytes corresponded with the decrease in ICE activation; 3) JAK3−/− macrophages showed significantly reduced IL-10 production compared with its WT macrophages; 4) the exogenous addition of IL-10 to monocytes suppressed their ICE activation; and 5) blockade of autocrine IL-10 function with an Ab to IL-10 significantly enhanced ICE activation. Taken together, these observations indicate that JAK3 signaling suppresses LPS-induced ICE activation at least in part by promoting IL-10 production. As mentioned, we could not detect significant production of IL-4 in our purified monocyte preparations, but subsequent experiments may explain how JAK3 functions in our LPS model. IL-4 binds to a complex receptor system composed of one IL-4R α-chain (which associates with JAK1) and the IL-2R γc (which associates with JAK3) (reviewed in Refs. 23, 24 , and 27). The γc is necessary for IL-4 regulation of LPS-induced IL-10 production in monocytes/macrophages (42). It appears that a similar pathway is used in LPS-stimulated monocytes, as we showed that JANEX-1, a JAK3-specific inhibitor, suppressed IL-10 production in a dose-dependent fashion. Thus, LPS stimulation induces IL-10 in a JAK3-dependent fashion. In summary, our results suggest that ICE activity may be controlled by suppressive cytokines. Because a JAK3 inhibitor promoted ICE activity, we initially focused on IL-4 as it signals through JAK3. IL-4 inhibited ICE activity in a JAK3-dependent fashion. However, IL-4 was not induced in our monocyte model. In contrast, IL-10, another classic suppressive cytokine, but one that does not signal through JAK3, was induced by LPS. In this regard, we were able to demonstrate that blockade of IL-10 enhanced ICE activation, and induction of IL-10 suppressed ICE activation. Thus, one might conclude that IL-10 and JAK3 are parallel pathways, and both function to suppress ICE activity. Nevertheless, IL-4 induced IL-10 production via a JAK3-dependent pathway (Fig. 6⇑), and importantly, LPS induced IL-10 via JAK3 (Figs. 7⇑ and 8⇑). Thus, we believe that the data presented in this study support the hypothesis that JAK3 activation is upstream of IL-10, providing a common pathway to down-regulate ICE activation. The connections between JAK3 signaling and LPS-induced ICE activity or LPS-induced IL-10 are novel. However, the mechanism(s) by which IL-10 inhibits ICE activation remains to be elucidated. One potential explanation may be via the ability of IL-10 to influence the inflammasome. The inflammasome functions to activate ICE and requires a concerted action of several PYRIN- and CARD-containing proteins (21). Of note, in murine macrophages, both IL-10 and IL-4 induce pyrin (43). Pyrin interacts with a CARD of apoptosis-associated speck-like protein (44), which activates ICE (22), leading to inhibition of IL-1β processing in macrophages (43). In fact, ICE activation is enhanced in pyrin-mutant macrophages (43). These results support the possibility that pyrin is a downstream effector of IL-10. Interestingly, IL-10-induced pyrin expression is diminished in JAK3 KO macrophages (43). Taken in the context of our recent findings linking JAK3 to ICE activation, pyrin is a strong candidate to be the mediator of the JAK3 effect. Another example to support a connection between LPS-induced ICE activity and the level of LPS-induced IL-10 is the difference between monocytes and macrophages in IL-1β processing and release. Monocytes are highly inducible to process and release IL-1β compared with macrophages, despite similar levels of total IL-1β production and proICE (37, 45). This observation is in line with our findings that LPS-induced ICE activity in macrophages is lower (37). In this context, it is remarkable that macrophages produce more IL-10 (∼2.5-fold) upon LPS stimulation than monocytes (42). Thus, the previously recognized discrepancy between monocytes and macrophages for IL-1β processing and release may be explained by differences in LPS-induced IL-10 and, hence, differences in LPS-induced ICE activity. Besides the induction of the inhibitory pyrin, other potential mechanisms by which IL-10 may be involved in suppressing LPS-induced ICE activation include 1) the induction of the suppressor of cytokine synthesis-3 through a STAT3-dependent pathway (46, 47, 48); and 2) inhibition of NF-κB activity (49) by blocking NF-κB nuclear translocation via suppressing IKK activity or by blocking DNA binding of NF-κB already present in the nucleus (50). Dysregulation of IL-1β processing and release is linked with severe clinical disease, such as sepsis, acute respiratory distress syndrome, rheumatoid arthritis, and overwhelming infection (3, 4, 5, 6, 7, 51). Also, IL-18, another proinflammatory cytokine activated by ICE, is involved in numerous diseases, such as sepsis, myocardial suppression, collagen-induced arthritis, inflammatory bowel disease, and hepatic injury (reviewed in Ref. 52). In addition to providing resistance to endotoxic shock (53), the ICE KO state reduces symptoms related to acute dextran sodium sulfate-induced colitis in mice, providing evidence for an anti-inflammatory strategy for intestinal inflammation (54). Abnormal levels of IL-10 seem to be connected to pathological conditions, for example, IL-10 overexpression in lymphoma and IL-10 deficiency in inflammatory bowel disease and psoriasis (reviewed in Ref. 48). Numerous studies of IL-10 have demonstrated that IL-10 can be used as a therapeutic tool in pathological diseases. Our present report not only provides mechanistic insight into the down-regulation of the inflammatory process via JAK3-mediated reduction of ICE activity, but may provide additional biological plausibility for the role of IL-10 therapy in the management of proinflammatory disease states. We thank Doug Miller for the ICE Abs. We also thank Susheela Tridandapani and Clark Anderson for helpful comments in the preparation of this manuscript. ↵1 This work was supported by National Institutes of Health HL40871. ↵3 Abbreviations used in this paper: ICE, IL-1β-converting enzyme; γc, common γ-chain; CARD, caspase recruitment domain; JAK, Janus kinase; KO, knockout; WT, wild type; AMC, (7-amino-4-methylcoumarin); PP2, (4-amino-5-(4-chlorophenyl)-7-(t-butyl)pyrazolo[3,4-d]pyrimidine). Fantuzzi, G., C. A. Dinarello. 1999. Interleukin-18 and interleukin-1β: two cytokine substrates for ICE (caspase-1). J. Clin. Immunol. 19:1. Cao, Z., M. Tanaka, C. Regnier, M. Rothe, A. Yamit-hezi, J. D. Woronicz, M. E. Fuentes, M. H. Durnin, S. A. Dalrymple, D. V. Goeddel. 1999. NF-κB activation by tumor necrosis factor and interleukin-1. Cold Spring Harb. Symp. Quant. Biol. 64:473. Jacobs, R. F., D. R. Tabor, A. W. Burks, G. D. Campbell. 1989. Elevated interleukin-1 release by human alveolar macrophages during the adult respiratory distress syndrome. Am. Rev. Respir. Dis. 140:1686. Siler, T. M., J. E. Swierkosz, T. M. Hyers, A. A. Fowler, R. O. Webster. 1989. Immunoreactive interleukin-1 in bronchoalveolar lavage fluid of high-risk patients and patients with the adult respiratory distress syndrome. Exp. Lung Res. 15:881. Pugin, J., B. Ricou, K. P. Steinberg, P. M. Suter, T. R. Martin. 1996. Proinflammatory activity in bronchoalveolar lavage fluids from patients with ARDS, a prominent role for interleukin-1. Am. J. Respir. Crit. Care Med. 153:1850.
van der Meer, J. W., M. Barza, S. M. Wolff, C. A. Dinarello. 1988. A low dose of recombinant interleukin 1 protects granulocytopenic mice from lethal gram-negative infection. Proc. Natl. Acad. Sci. USA 85:1620. Chen, W., E. A. Havell, L. L. Moldawer, K. W. McIntyre, R. A. Chizzonite, A. G. Harmsen. 1992. Interleukin 1: an important mediator of host resistance against Pneumocystis carinii. J. Exp. Med. 176:713. Cerretti, D. P., C. J. Kozlosky, B. Mosley, N. Nelson, K. Van Ness, T. A. Greenstreet, C. J. March, S. R. Kronheim, T. Druck, L. A. Cannizzaro, et al 1992. Molecular cloning of the interleukin-1β converting enzyme. Science 256:97. Thornberry, N. A., H. G. Bull, J. R. Calaycay, K. T. Chapman, A. D. Howard, M. J. Kostura, D. K. Miller, S. M. Molineaux, J. R. Weidner, J. Aunins, et al 1992. A novel heterodimeric cysteine protease is required for interleukin-1β processing in monocytes. Nature 356:768. Ghayur, T., S. Banerjee, M. Hugunin, D. Butler, L. Herzog, A. Carter, L. Quintal, L. Sekut, R. Talanian, M. Paskind, et al 1997. Caspase-1 processes IFN-γ-inducing factor and regulates LPS-induced IFN-γ production. Nature 386:619. Gu, Y., K. Kuida, H. Tsutsui, G. Ku, K. Hsiao, M. A. Fleming, N. Hayashi, K. Higashino, H. Okamura, K. Nakanishi, et al 1997. Activation of interferon-γ inducing factor mediated by interleukin-1β converting enzyme. Science 275:206. Ayala, J. M., T. T. Yamin, L. A. Egger, J. Chin, M. J. Kostura, D. K. Miller. 1994. IL-1β-converting enzyme is present in monocytic cells as an inactive 45-kDa precursor. J. Immunol. 153:2592. Schumann, R. R., C. Belka, D. Reute, N. Lamping, C. J. Kirschning, J. R. Weber, D. Pfeil. 1998. Lipopolysaccharide activates caspase-1 (interleukin-1-converting enzyme) in cultured monocytic and endothelial cells. Blood 91:577. Schonbeck, U., F. Mach, J. Y. Bonnefoy, H. Loppnow, H. D. Flad, P. Libby. 1997. Ligation of CD40 activates interleukin 1β-converting enzyme (caspase-1) activity in vascular smooth muscle and endothelial cells and promotes elaboration of active interleukin 1β. J. Biol. Chem. 272:19569. Walker, N. P., R. V. Talanian, K. D. Brady, L. C. Dang, N. J. Bump, C. R. Ferenz, S. Franklin, T. Ghayur, M. C. Hackett, L. D. Hammill, et al 1994. Crystal structure of the cysteine protease interleukin-1β-converting enzyme: a (p20/p10)2 homodimer. Cell 78:343. Wilson, K. P., J. A. Black, J. A. Thomson, E. E. Kim, J. P. Griffith, M. A. Navia, M. A. Murcko, S. P. Chambers, R. A. Aldape, S. A. Raybuck, et al 1994. Structure and mechanism of interleukin-1β converting enzyme. Nature 370:270. Yamin, T. T., J. M. Ayala, D. K. Miller. 1996. Activation of the native 45-kDa precursor form of interleukin-1-converting enzyme. J. Biol. Chem. 271:13273. Mehta, V. B., J. Hart, M. Wewers. 2001. ATP-stimulated release of interleukin (IL)-1β and IL-18 requires priming by lipopolysaccharide and is independent of caspase-1 cleavage. J. Biol. Chem. 276:3820. Bouchier-Hayes, L., S. J. Martin. 2002. CARD games in apoptosis and immunity. EMBO Rep. 3:616. Weber, C. H., C. Vincenz. 2001. The death domain superfamily: a tale of two interfaces?. Trends Biochem. Sci. 26:475. Martinon, F., K. Burns, J. Tschopp. 2002. The inflammasome: a molecular platform triggering activation of inflammatory caspases and processing of proIL-β. Mol. Cell. 10:417. Srinivasula, S. M., J. L. Poyet, M. Razmara, P. Datta, Z. Zhang, E. S. Alnemri. 2002. The PYRIN-CARD protein ASC is an activating adaptor for caspase-1. J. Biol. Chem. 277:21119. Imada, K., W. J. Leonard. 2000. The Jak-STAT pathway. Mol. Immunol. 37:1. Rane, S. G., E. P. Reddy. 2000. Janus kinases: components of multiple signaling pathways. Oncogene 19:5662. Leonard, W. J.. 2001. Role of Jak kinases and STATs in cytokine signal transduction. Int. J. Hematol. 73:271. Habib, T., S. Senadheera, K. Weinberg, K. Kaushansky. 2002. The common γ chain (γc) is a required signaling component of the IL-21 receptor and supports IL-21-induced cell proliferation via JAK3. Biochemistry 41:8725. Leonard, W. J.. 2001. Cytokines and immunodeficiency diseases. Nat. Rev. Immunol. 1:200. Buckley, R. H.. 2000. Advances in the understanding and treatment of human severe combined immunodeficiency. Immunol. Res. 22:237. Mella, P., R. F. Schumacher, T. Cranston, G. de Saint Basile, G. Savoldi, L. D. Notarangelo. 2001. Eleven novel JAK3 mutations in patients with severe combined immunodeficiency-including the first patients with mutations in the kinase domain. Hum. Mutat. 18:355. Villa, A., M. Sironi, P. Macchi, C. Matteucci, L. D. Notarangelo, P. Vezzoni, A. Mantovani. 1996. Monocyte function in a severe combined immunodeficient patient with a donor splice site mutation in the Jak3 gene. Blood 88:817. Nosaka, T., J. M. van Deursen, R. A. Tripp, W. E. Thierfelder, B. A. Witthuhn, A. P. McMickle, P. C. Doherty, G. C. Grosveld, J. N. Ihle. 1995. Defective lymphoid development in mice lacking Jak3. Science 270:800. Park, S. Y., K. Saijo, T. Takahashi, M. Osawa, H. Arase, N. Hirayama, K. Miyake, H. Nakauchi, T. Shirasawa, T. Saito. 1995. Developmental defects of lymphoid cells in Jak3 kinase-deficient mice. Immunity 3:771. Saijo, K., S. Y. Park, Y. Ishida, H. Arase, T. Saito. 1997. Crucial role of Jak3 in negative selection of self-reactive T cells. J. Exp. Med. 185:351. Musso, T., J. A. Johnston, D. Linnekin, L. Varesio, T. K. Rowe, J. J. O’Shea, D. W. McVicar. 1995. Regulation of JAK3 expression in human monocytes: phosphorylation in response to interleukins 2, 4, and 7. J. Exp. Med. 4:1425. Thornberry, N. A., T. A. Rano, E. P. Peterson, D. M. Rasper, T. Timkey, M. Garcia-Calvo, V. M. Houtzager, P. A. Nordstrom, S. Roy, J. P. Vaillancourt, et al 1997. A combinatorial approach defines specificities of members of the caspase family and granzyme B: functional relationships established for key mediators of apoptosis. J. Biol. Chem. 272:17907. Nicholson, D. W., A. Ali, N. A. Thornberry, J. P. Vaillancourt, C. K. Ding, M. Gallant, Y. Gareau, P. R. Griffin, M. Labelle, Y. A. Lazebnik, et al 1995. Identification and inhibition of the ICE/CED-3 protease necessary for mammalian apoptosis. Nature 376:37. Herzyk, D. J., A. E. Berger, J. N. Allen J. N., M. D. Wewers. 1992. Sandwich ELISA formats designed to detect 17 kDa IL-1β significantly underestimate 35 kDa IL-1β. J. Immunol. Methods 148:243. Huberty, C. J., J. D. Morris. 1989. Multivariate analysis versus multiple univariate analyses. Psychol Bull. 114:145. Sudbeck, E. A., X. P. Liu, R. K. Narla, S. Mahajan, S. Ghosh, C. Mao, F. M. Uckun. 1999. Structure-based design of specific inhibitors of Janus kinase 3 as apoptosis-inducing antileukemic agents. Clin. Cancer Res. 5:1569. Uckun, F. M., E. A. Sudbeck, C. Mao, S. Ghosh, X. P. Liu, A. O. Vassilev, C. S. Navara, R. K. Narla. 2001. Structure-based design of novel anticancer agents. Curr. Cancer Drug Targets 1:59. Bonder, C. S., J. J. Finlay-Jones, P. H. Hart. 1999. Interleukin-4 regulation of human monocyte and macrophage interleukin-10 and interleukin-12 production: role of a functional interleukin-2 receptor γ-chain. Immunology 96:529. Chae, J. J., H. D. Komarow, J. Cheng, G. Wood, N. Raben, P. P. Liu, D. L. Kastner. 2003. Targeted disruption of pyrin, the FMF protein, causes heightened sensitivity to endotoxin and a defect in macrophage apoptosis. Mol. Cell. 11:591. Richards, N., P. Schaner, A. Diaz, J. Stuckey, E. Shelden, A. Wadhwa, D. L. Gumucio. 2001. Interaction between pyrin and the apoptotic speck protein (ASC) modulates ASC-induced apoptosis. J. Biol. Chem. 276:39320. Wewers, M. D., D. J. Herzyk. 1989. Alveolar macrophages differ from blood monocytes in human IL-1β release: quantitation by enzyme-linked immunoassay. J. Immunol. 143:1635. Cassatella, M. A., S. Gasperini, C. Bovolenta, F. Calzetti, M. Vollebregt, P. Scapini, M. Marchi, R. Suzuki, A. Suzuki, A. Yoshimura. 1999. Interleukin-10 (IL-10) selectively enhances CIS3/SOCS3 mRNA expression in human neutrophils: evidence for an IL-10-induced pathway that is independent of STAT protein activation. Blood 94:2880. Ito, S., P. Ansari, M. Sakatsume, H. Dickensheets, N. Vazquez, R. P. Donnelly, A. C. Larner, D. S. Finbloom. 1999. Interleukin-10 inhibits expression of both interferon α- and interferon γ-induced genes by suppressing tyrosine phosphorylation of STAT1. Blood 93:1456. Asadullah, K., W. Sterry, H. D. Volk. 2003. Interleukin-10 therapy: review of a new approach. Pharmacol. Rev. 55:241. Wang, P., P. Wu, M. I. Siegel, R. W. Egan, M. M. Billah. 1995. Interleukin (IL)-10 inhibits nuclear factor κB (NFκB) activation in human monocytes. IL-10 and IL-4 suppress cytokine synthesis by different mechanisms. J. Biol. Chem. 270:9558. Schottelius, A. J., M. W. Mayo, R. B. Sartor, A. S. Baldwin, Jr. 1999. Interleukin-10 signaling blocks inhibitor of κB kinase activity and nuclear factor κB DNA binding. J. Biol. Chem. 274:31868. Dayer, J.. 2003. The pivotal role of interleukin-1 in the clinical manifestations of rheumatoid arthritis. Rheumatology 42:ii3. Dinarello, C. A., G. Fantuzzi. 2003. Interleukin-18 and host defense against infection. J. Infect. Dis. 187:S370. Siegmund, B., H. A. Lehr, G. Fantuzzi, C. A. Dinarello. 2001. IL-1β-converting enzyme (caspase-1) in intestinal inflammation. Proc. Natl. Acad. Sci. USA 98:13249.